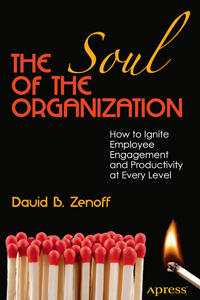 Based on David B. Zenoff’s extensive experience observing and consulting to some of the best-known companies and not-for-profit organizations in the world, The Soul of the Organization journeys into eleven soulful, high-performing organizations operating in both the for-profit and not-for-profit worlds to determine the underlying qualities and influences that foster long-lasting employee engagement at all levels. What Zenoff finds in his inquiry and reflections is that organizations as different as home goods retailer Williams-Sonoma and not-for-profit group Larkin Street Youth Services all share in common five key elements that, taken together, exude powerful forces for tapping into employees’ heads and hearts, thus fostering high levels of engagement, satisfaction, and meaning. Beyond identifying, explaining, and exemplifying the five core elements that comprise an organization’s soul, Zenoff goes on to offer both a conceptual framework and a practical primer on how to leverage awareness of these key ingredients to create, sustain, and nourish the soul in your organization. The Soul of the Organization is written for the thousands of leaders, managers, human resources directors, and employees in both for-profit and not-for-profit organizations who want to know what they can do so their organizations become the kind of high-performing workplaces illustrated in this book. The Soul of the Organization will also appeal to prospective employers at all levels as well as the vast number of prospective employees who are trying to find organizations to join that offer opportunities for sustained satisfaction and meaning from their workplace. If you find that your organization is one of the countless ones struggling with sub-par employee loyalty, commitment, and drive, you will find the guidance you need in The Soul of the Organization to infuse into your workplace that “special something” illustrated throughout this book that engages employees, drives their productivity, and taps into their collective well of potential so that your organization can seek to make its mark on the world. The five essential ingredients that contribute so importantly to strong emotional and intellectual bonds between organizations and their employees. How deep soulful organizational connections with their employees drive overall high performance. How organizations as different as Barclays Global Investors and the Sisters of Mercy manifest the five essential ingredients of soul in their workplaces. The best practices of organizations that have sustained and nourished their souls over many years despite leadership transitions and organizational adaptations to changing times. The many potential threats to the health of an organization’s soul, as well as the various remedies that exemplary organizations have found to protect and preserve their souls. How young organizations can identify and nourish their soul, and how longer lived organizations without awareness of their souls can find and nourish theirs.